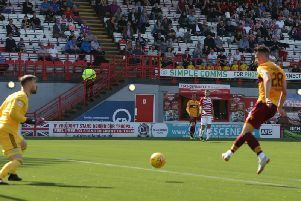 Motherwell FC made their sixth new acquisition of the summer on Monday with the signing of robust Irish striker Conor Sammon, on loan from Hearts for the season. The 31-year-old Irishman, who played against 'Well for Partick Thistle last season, has had a long and established career north and south of the border, once playing in the English Premier League for Wigan Athletic before joining Derby County for a cool £1.2 million in 2012. "I'm delighted to get it sorted," Conor told the Motherwell FC website. "I'm looking forward to a great opportunity for me coming here for the season. "It's a club that have had a really good season last year. From playing against them, they are a very difficult side to play against. I was impressed with huge aspects of their side and the manager. "It's a club that I'm looking forward to being a part of, getting settled in and finding my feet. I'm excited about the season ahead. "It's up to me to make the most of it. There is great competition for places throughout the squad which I think is a brilliant thing. "I'm just looking forward to getting stuck in to hopefully playing a lot of games here. The other strikers are very similar, physical, strong quick. "So I definitely think I can fit in here and have a good season."